You name it and we have it. 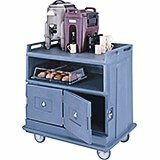 Here, at DEI Equipment, we have all the Catering & Transport Equipment, which you are ever going to need for running your bakery, restaurant, or catering business smoothly and successfully. All the offerings listed in this section come to you from the well-known brand - Cambro. 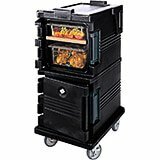 These catering and transport equipment will help you do outdoor catering and also in transporting the food to outside locations by keeping its quality and taste perfectly protected. With products like beverage carts and beverage dispensers, you will find it very convenient to serve the guests in a big party hall. Similarly, our bulk food holding cabinets and carriers for food storage boxes will hold the food in a good condition during transportation. 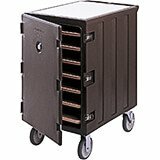 Roll this cart in to any room for immediate service. Ideal for breakfast or snack programs at schools, offices and meeting rooms. The open compartment can store drinkware, additional food items or other supplies. The two insulated compartments can also be used for food storage, especially during transport. 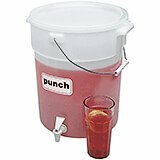 Find the best beverage dispensers for catering. Keep beverages hot or cold for hours with our insulated models, one piece, double-wall construction prevents liquids from seeping between walls. Perfect for business of home use. Keep cold food cold, hot food hot, moist food moist and crisp food crisp! 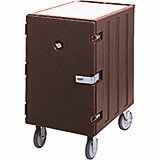 These bulk food holding and transporting cabinets uniquely combine electrical capability with Cambro's reliable, insulated, durable construction. The result is a cabinet that maintains hot or hot/cold temperatures as well as offering excellent moisture retention. Our insulated food pan carriers and carts are available in top and front loading styles and have the ability to hold full, 1/2 and 1/3 size food pans depending on the model you select. Offered in a in a wide variety of sizes and colors to fit in any decor. 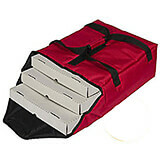 Insulated carriers available with one or two compartments to hold 18" x 26" Food Storage Boxes. Security packages available with tamper resistant hardware which protects the cart and the food inside. 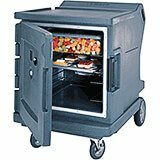 These insulated carriers and carts for sheet pans and trays keep the heat in so the food you serve always reflects your high-quality standards. 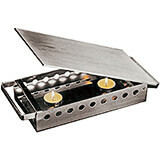 Available with one or two compartments and with tamper-resistant packages for high security applications. Our chafing dishes and food warmers come in many shapes and sizes to fit your business or home use. Chafing dishes are perfect for heating food during buffet display. Available in front-loading styles, great for pizza boxes and top-loading any other food items that need to be kept hot and protect your food quality and temperature from your business' kitchen to the customer. 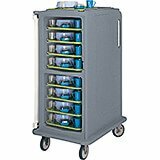 Safely transport plated meals by the tray from centralized kitchens to acute care patients, nursing home clients or inmates, ensuring optimum food quality within short delivery times. 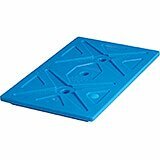 Tough one-piece double-wall polyethylene construction is easy to clean and maintain. Optimize Food Holding Performance. These accessories will ensure cold foods are safely held below 41°F. or help keep hot food above 140°F for almost 2 hours longer. Camchiller, Thermobarrier and Camwarmer.